There will come a time when you need to send sympathy wishes. Losing a loved one is a tragedy we all have to deal with at some point in our lives. When you find yourself close to someone who must face this experience, how can you express your deep sadness for them? You want to send sympathy wishes, but nothing seems quite appropriate. Nothing can show them that you feel the pain they are going through. And unless you have experienced the pain yourself, you don't actually know how they feel. You can only imagine how deeply wounded and lost they must be. You wish you could take all the pain away and feel quite at a loss yourself in expressing how you wish you could help. You want to show your support and to help them get through the sadness. But how? When a parent dies, the pain is great, but it is a part of life that you know will happen. The cycle of life dictates that our parents will pass on and leave us to suffer the loss. As hard as it is to deal with when it happens, we can not say it is unexpected. That being said, losing any loved one - a friend, a relative, a sibling, a spouse, or a child - these losses too can be so very difficult to comprehend and deal with. Remember. We are all so individual in our grief. No one knows how long we hold onto it to let it go it's course or how quickly we send it away to continue on with our lives. However, by being one in helping to console those who have lost someone dear to them, you can lighten the load with your personal touch in your sympathy wishes. Those who are mourning appreciate it. At times, their hearts can be so heavy; all they need is the support to carry them forward. You can hold each other. You can be that shoulder to cry on. You can show that you are there for them, but at the end of the day they will still be without their loved ones. And YES. Finding the right words is nearly impossible. When someone is so deeply wounded, you have to be very careful about the words you choose. Most of us have a hard time putting our true feelings into words in any situation. Trying to express sympathy wishes is a delicate process. In times like these it would be nice to have someone help you put your feelings into words. It would be nice to have a physical expression of your love your friend can hold in their hand when the pain gets to be too much to bear. 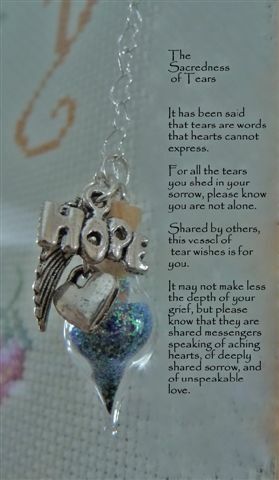 Captured Wishes has created just such a magical sympathy gift. A gift that captures all the good things in life to help the bereaved deal with the future without their loved one. A Captured Wishes gift is a small bottle filled with pixie dust; holographic glitter representing your wishes of empathy, healing and forgiveness and love and caring. One of the feelings we have when someone dies is anger. Either anger with the universe, the powers that be, questioning God for allowing this to happen. Or regret for not being able to prevent the death; feeling personally responsible somehow because their loved one died. And, although we will never admit it out loud, we may feel anger towards the person who died and left us to be filled with despair. That is why your sympathy wishes gift whispers at thoughts of forgiveness. Sometimes we have to forgive before we can put the pieces of shattered life back together and begin the healing process. 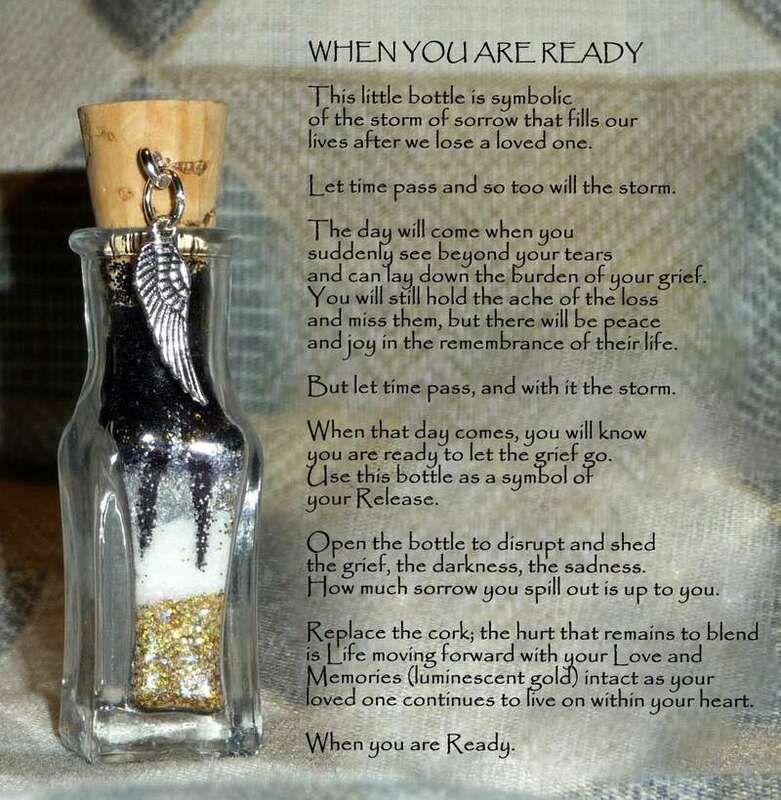 All of these wishes are carefully placed into a small glass bottle, accompanied with a special verse that expresses what you are trying to say and topped off with magical charms. The friend who receives this gift will be truly filled with sudden awe when they realize this is a powerful gift of love. It won't bring back the loved one, but for a moment or two the comfort of such obvious support opens the door to healing a little wider. When words just aren't enough or you just can't seem to find the right words, let the unique and chic gift of sympathy wishes from Captured Wishes do the talking for you.